I get my inspiration from a range of different people – not so much from the materials people use to make their art, but from how it makes me feel or the story behind it. Here are just a few people I am very inspired by…. 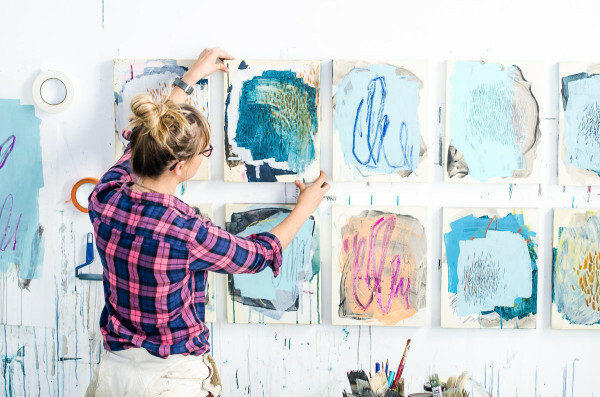 I found Heather on Instagram (where actually I find I get a lot of inspiration from seeing artists in action, in their studios, and their work in progress). What I love about her is that she is so prolific, as well as the freedom and scale of her work. She is all about making a mess and exploring. Leading up to my first exhibition in May this year, I was feeling quite stuck creatively, so I set myself a challenge to get my creativity flowing again. During April (30 days) I would paint/draw for at least 1/2 hour each day just for fun. I managed 29 days out of 30 – day 29 was spent doing a lot of work to get my exhibition ready. But I consider that an overall success! This piece is a collaboration – a conversation between music and art. The image below came about as a result of an evening out with my friend Jason O’Dwyer. We were talking about music and art, emotion, expression and connection, and I was inspired to produce an image as a result of this. I drew it on the tube on the way home and then painted into it the next morning. He then produced a piece of music in response to this, and we have continued the conversation! I’m really keen to do more collaboration pieces like this. And you can listen to more of Jason’s music here. I hope you enjoy listening to the conversation as much as I am enjoying being part of it!